As the plane lifted off from Tehran, I paused the movie I had started and just looked out the window for awhile. It all seemed like it was happening too quickly. Iran had been a whirlwind of activity, and now I was moving on to another country, another culture, without any time to really process. So I took out my journal, and what I found myself writing was a thank you note to Iran. "Now we're head scarf-less and somewhere over western Iran. I'm excited to see Isabel and explore Turkey, but it also feels a bit rushed. I'm still processing Iran and coming to terms with the leaving. That's one of my least favorite parts about this 3 month journey - I'm constantly moving from one thing to the next, and I think I miss out on both the anticipation/preparation, and also the processing/saying goodbye. Thank you for all of the warm, welcoming people who said hello on the streets, helped us order food or buy things in stores, welcomed us to Iran, and invited us to their homes. By far the highlight of the trip. Thank you for mid-morning tea, and afternoon tea, and evening tea - and all the teas in between - and the sweets that came with them. Thank you for preserving your ancient and slightly-less-ancient-but-still-really-old history to share with the world. Thank you for the attention to beautiful details - in mosque tiles, mirrored shrines, rock tombs and carpet patterns. Thank you for the juiciest dates, sweets full of cardamom, saffron rice, fresh pomegranate juice and fake mojitos. Thank you for Amin [our guide] and his knowledge of Persian history, his love of his country, and his eagerness to share it all with us. Thank you for music and poetry that move you even when you don't understand the words. Thank you for being a country where young men and women can sincerely quote the works of 12th-century poets. Thank you for proving the world wrong. I had a feeling that would be the case, but you really never know. Thank you for a beautiful, safe, enlightening, welcoming, fun and surprising journey. I really hope to come back one day. I hope some things will have changed for the better (hejab! the driving! the visa process. ), but I hope the spirit and warmth of the people always stay the same. P.S. Americans and Brits are required to travel to Iran with a tour group or approved private guide. 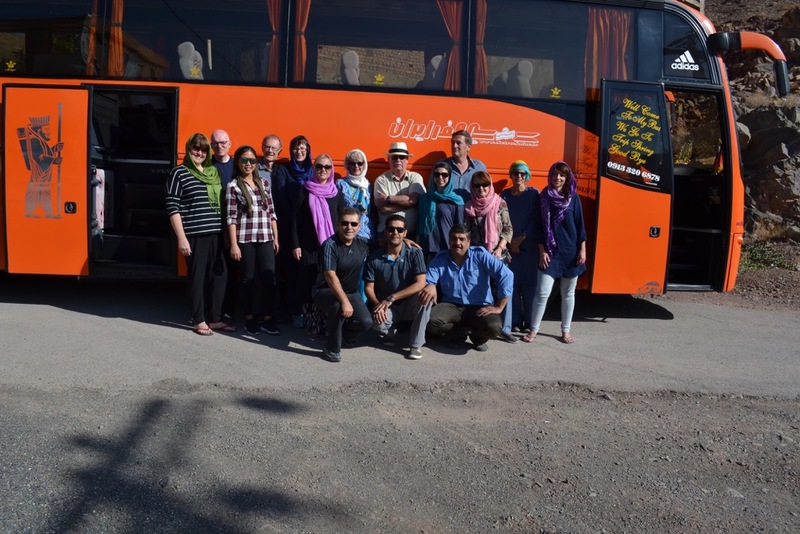 I spent 2 weeks in Iran with the G Adventures Discover Persia tour. If you're interested in history and architecture, I highly recommend it. If you want to create your own itinerary in Iran, our fantastic guide, Amin, also does custom tours - email me or leave me your email address in the comments and I can put you in touch with him! There's some places I'm dying to travel to (namely, Afghanistan and Iran), but when I mention them people kind of look at me like, WHAT, why!? (Especially, I think, because I am Israeli). But I've learned long ago that countries and their peoples are so, so much more than politics and sanctions and angry speeches at the UN. I really hope that someday I have the opportunity to travel to those places. I'm glad Iran was a wonderful experience for you! As an American I find I'm often reduced in people's minds to my government's actions (all other Westerners wanted to talk about with me was Trump), and I can only imagine that it's even more so for Israelis. The capacity of Iranians to separate people from politics was so refreshing. I hope you're able to visit there - and everywhere else you're dreaming about - one day!